October 10, 2018, 2:00 p.m. The Federal Reserve Bank of New York placed the nation’s outstanding student loan debt at $1.41 trillion this year. 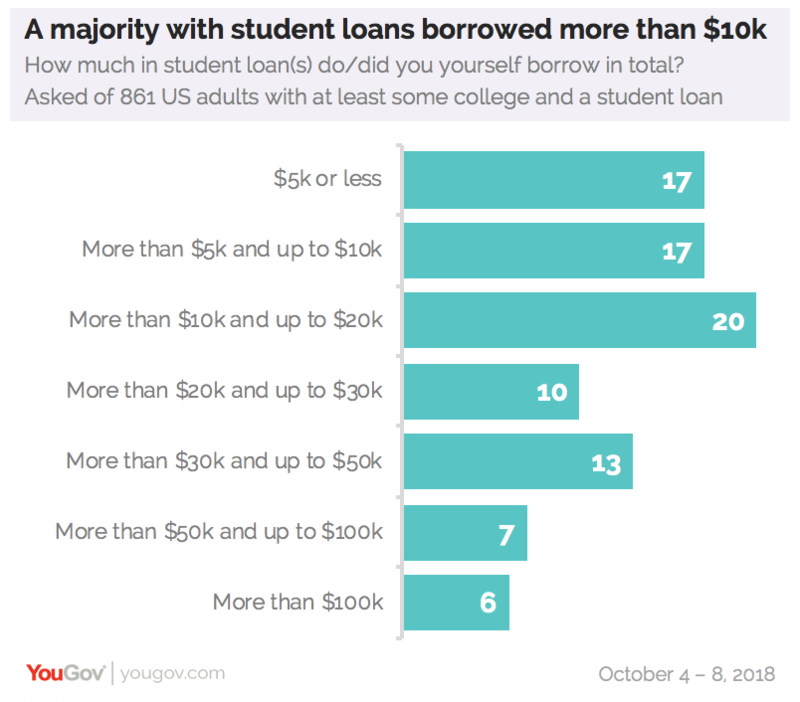 In the last several years, the average cost of college tuition and fees increased and new data from YouGov Omnibus shows more than a quarter (27%) of Americans who attended at least some college have an outstanding student loan. 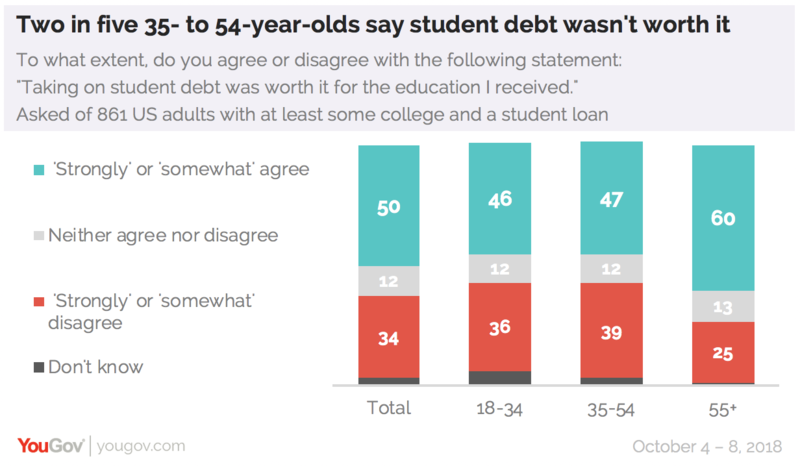 The study also surveys sentiment around student debt and finds that out of all the bills they will have to pay this month, close to half (45%) of 18- to 34-year-olds with a student loan consider it their “top” or “one of [their] main concerns”. Among Americans who have attended at least some college, 51% have taken out a loan. That includes the 27% who currently have an outstanding student loan and the 24% who had a loan but have since repaid in full. The likelihood of having an outstanding student loan is highest among 18- to 34-year-olds, 45% of whom report having a loan that has not been paid off yet. Of those with loans, a majority (56%) report that they borrowed more than $10,000. A third (34%) report that they borrowed less than that amount. 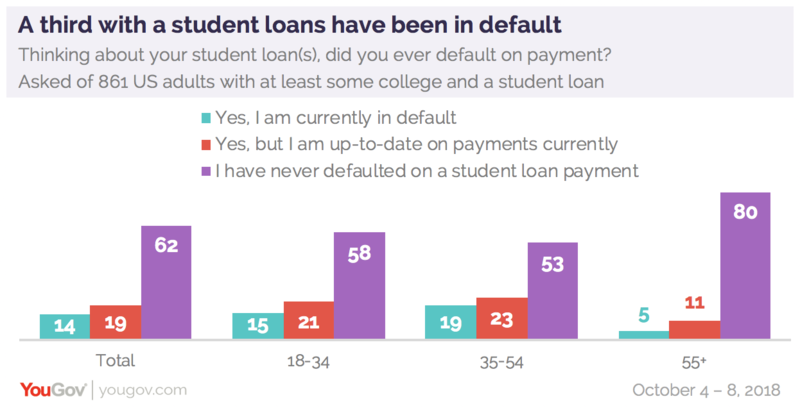 As for actually paying off these loans, nearly a third (32%) report being in default at least once in their loan history. 18- to 34-year-olds (36%), and 35- to 54-year-olds (42%) are especially likely to have missed a payment. A majority (66%) of borrowers have sought out different ways to help pay off their loans. The most popular method is to defer or postpone payments until an agreed upon date in the future (34%). Other methods that borrowers opt for include using an income driven repayment plan (25%), refinancing a student loan (13%), applying for forbearance (temporarily reducing the payment amount - 12%), using an extended repayment plan (11%), and discussing their options with a loan officer (10%). What’s more, an alarming 37% of borrowers with outstanding loans are pessimistic as to whether they’ll ever be out from under them. 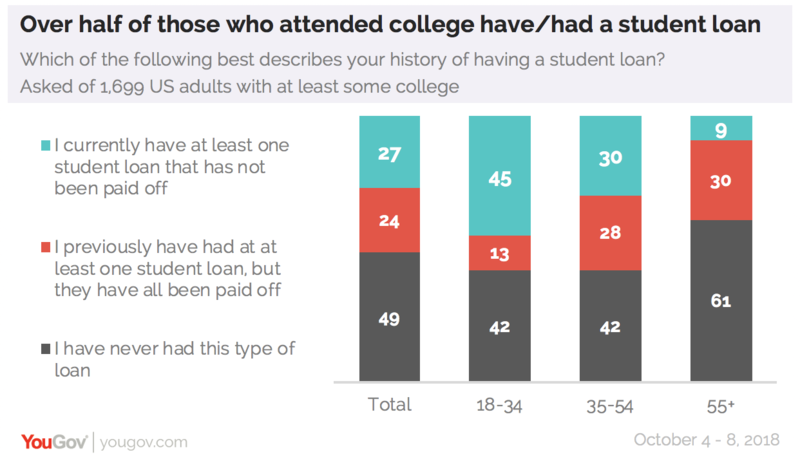 This figure is especially high among 35- to 54-year-olds, 46% of whom say they are pessimistic about eventually paying off their student loan. In general, a majority (56%) of these borrowers remain optimistic about being able to pay off their student loan in full. Half of those with a student loan (50%) agree that the education they received was worth the debt they accrued, including 46% of 18- to 34-year-olds and 47% of 35- to 54-year-olds. 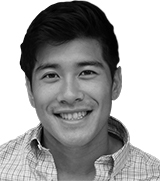 Notably, 36% of millennials and 39% of 35- to 54-year-olds disagree that the education was worth the debt. Lastly, in a question directed at Americans overall, more than half (53%) agree that they would still encourage a high school student to pursue higher education, regardless of the cost. A quarter (25%) of Americans disagree.